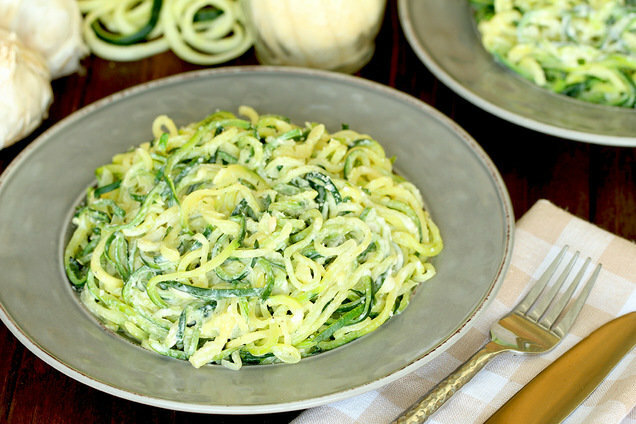 Z’paghetti: A low-carb spaghetti swap made from spiralized zucchini. Girlfredo: A creamy low-calorie sauce that tastes exactly like Alfredo. Too-Easy Z'paghetti Girlfredo: Our latest zucchini-noodle creation, complete with a super-simple sauce you’ll flip over! Bring a large skillet sprayed with nonstick spray to medium-high heat. Cook and stir zucchini until hot and slightly softened, about 3 minutes. Transfer to a strainer, and thoroughly drain. Remove skillet from heat, respray, and bring to medium-low heat. Add drained zucchini and remaining ingredients. Cook and stir until sauce is uniform and dish is hot, about 2 minutes. Hungry for More Zucchini-Noodle Recipes? OMG. It's April 26th, a.k.a. Hungry Girl’s anniversary. Lisa’s daily emails have officially been dropping into inboxes everywhere for 14 years -- WOW! Celebrate with a batch of these sprinkle-topped cupcakes.